Tonight! 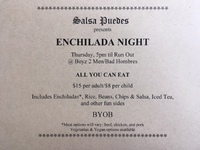 Enchilada Night at Salsa Puedes--$15 gets you ALL YOU CAN EAT! $8 for kids. Rice, beans, chips & salsa, iced tea, and BYOB.